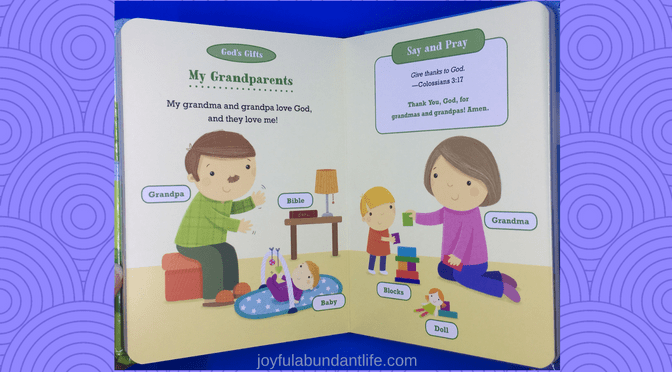 Say & Pray Devotions is an adorable hardback book for children that will help teach them the importance of reading God’s Word and associating everything with the Creator. The author is Diane Stortz and the illustrater is Sarah Ward. They have done a beautiful job in putting this little book together. Say & Pray Devotions is a durable book with wipe clean pages so when those sticky little fingers get all over it, you can easily wipe it clean. More important is what this book teaches. My grandchildren love books and even the smallest child will love this one. As you open the pages you will find a different subject to discuss with your little one. I love how each page has words and colors your child can learn. The best part is it has a memory verse to go with each page. What a wonderful way to teach your children God’s Word while they are very young. I really love that the gospel is put in under God’s love. This is a great way to stress God’s love for each of your children and the fact that they need a Savior. This is a wonderful book and would make a great birthday or Christmas gift. In fact, I’ll be giving mine as a gift to one of my grandchildren. You can get a copy here. “Disclosure (in accordance with the FTC’s 16 CFR, Part 255: “Guides Concerning the Use of Endorsements and Testimonials in Advertising”): Choice of Opinions are 100% my own and NOT influenced by monetary compensation. I did receive a sample of the product in exchange for this review and post. You can grab a free devotional book of your by signing up below. Once you sign up you will be sent a 30 day devotional ebook.